Re-posting this lovely feature on our resident extensions and hair colorist expert Kacey Welch via the online beauty portal Beauty In The Bag. 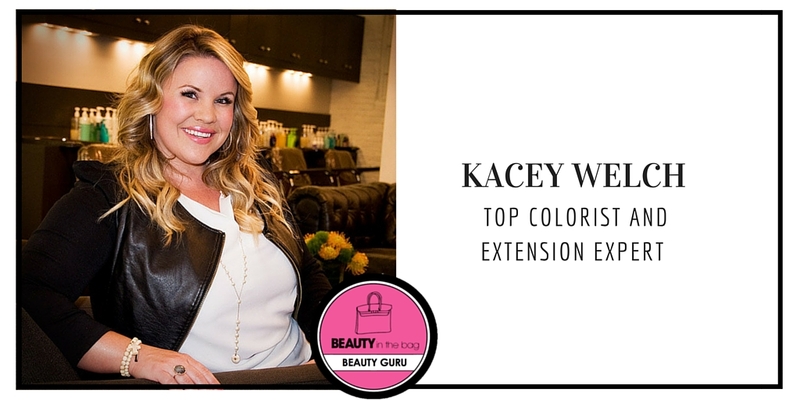 Read about Kacey’s advice on color and extensions and where the trends are headed this Spring! Los Angeles native, Kacey Welch, is one of the leading color and hair extension experts in the beauty world with clients including Kate Hudson, Goldie Hawn, Carmen Electra, Kirsten Dunst and Kristen Cavallari. Thanks to her advanced techniques and dedication to sourcing the finest human hair she’s a pioneer in her field and is actually in the process of creating her own hair extension company called the “Kacey Welch Method.” Welch is currently developing the line and in the planning stage of teaching other professionals to do what she does across the country. What sets her and her work apart is her commitment to optimum hair health and vitality for her clientele. Her extensions are tailor-made to each client’s own natural color and skin tone, allowing them to grow-out their own hair without compromising the health or existing color. 1. When did you know you’d found your calling? Forever. I’ve always known that I wanted to be a hair stylist. I guess it started when I was around thirteen years old; I cut the entire football team’s hair in my mom’s bathroom. But even before that I taught myself how to French braid and would always practice on my sister. 2. What makes you excel at what you do? Definitely hard work and passion. As well as talent and staying current with styles. I work with top tier clients, stars and tons of people who work in entertainment and they really trust me. I’ve also studied under phenomenal people like Justin Anderson. A lot of time and energy has gone into my career and that’s what makes me good at what I do! 3. Tell us 3 things we don’t know about extensions. When done properly, extensions don’t ruin natural hair. Extensions can enhance your hair, say if you got a bad haircut or want to grow hair out but don’t want to wait years. It’s a quick fix! Extensions ARE NOT one size fits all. There are different methods and they’re customized to match each individual person. Like a tailored dress – it’s all made to fit. 4. Tell us 3 things we don’t know about color. There are many tones and shades that sometimes you just can’t get right out of a box. A professional stylist will customize color with skin tone and eye color – the majority of color I do is classic, not trendy so it is great for day-to-day. I love to enhance natural beauty! Gray hair is the easiest hair to color! It’s like a blank canvas and picks up the color easy. Highlights can make you look at least 10 years younger. 5. For Winter into Spring, what direction do you see color heading? To make a statement, platinum blondes, dip dye techniques and fun bright colors are trending. To look natural, sun-kissed balayage or baby lights, honey blonde, brondes (right between blonde and brunette), and ronze (red with bronze tones) look classically beautiful. For brunettes, deep chocolate browns or black with blue undertones. 6. What are you can’t-live-without haircare or styling products? Please explain why. Oribe Dry Texturizing Spray is my obsession. It’s a great alternative to dry shampoo and doesn’t leave that chalky residue. Phytovolume Actif Volumizing Spray is another great one to enhance volume and body without stiffening or drying hair out. Davines Award Winning Love Shampoo and Conditioner makes hair ridiculously soft and frizz free.